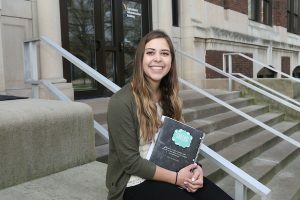 For Senior Mikaela Wieland, part of the attraction of attending Purdue was the opportunity to tell her family’s story. The Princeville, Illinois native got her first experience promoting agricultural communication in high school by providing marketing services for her family’s beef business. When she found out she could continue down that path as a career, she followed her interests to Purdue. A member of the Honors program, Wieland has gravitated toward opportunities to be engaged with faculty and conduct research. She appreciates that many of the classes have been smaller and more discussion-based, enabling her to build strong relationships with members of the department. As she reaches the end of her undergraduate studies, Wieland is focusing more on her research efforts, which began in the summer of 2016. Working with Dr. Mark Tucker in Youth Development and Ag Education (YDAE), she is studying consumer perceptions around food waste, specifically the beliefs people have about blemished produce. “A core element of the research is conducting a series of focus groups to better understand how consumers base their perceptions about blemished produce,” said Wieland. Wieland is nearing graduation and currently exploring her career options. She may attend graduate school, but she’s also interviewing for jobs in science agriculture journalism and agriculture marketing. Several firms exist that focus specifically on these areas. A number of non-profit organizations would also benefit from her experience. Wieland is open to wherever her career takes her and excited about the opportunities that will arise. She’s greatly enjoyed her time on campus and loved building relationships with the faculty and her academic advisors.